The action of the temporalis muscle is to elevate the mandible. If only the posterior fibres of the muscle are activated, it acts to retrude the mandible. The temporalis muscle takes origin from the temporal fossa of the temporal bone of the skull. 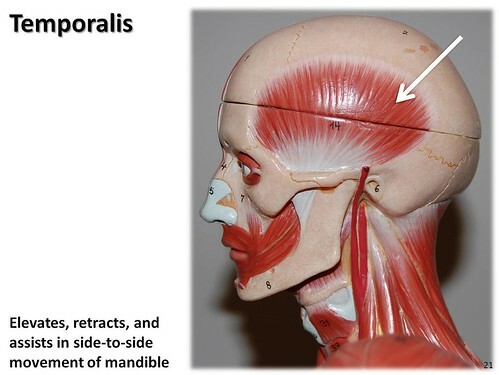 The temporalis muscle inserts onto the coronoid process and ramus of the mandible. The V3 (mandibular) branch of the trigeminal nerve (cranial nerve V) innervates the temporalis muscle.